The 2nd generation Chevrolet Chevelle was released in 1968 as a restyled version of the original mid-sized family car. The Chevelle continued to benefit from a trickle down supply of performance engines from the Corvette, and even when GM tried to pull the reins on non-Corvette performance, folks figured out ways of getting 427SS powered Chevelles, such as buying them on Indian reservations. 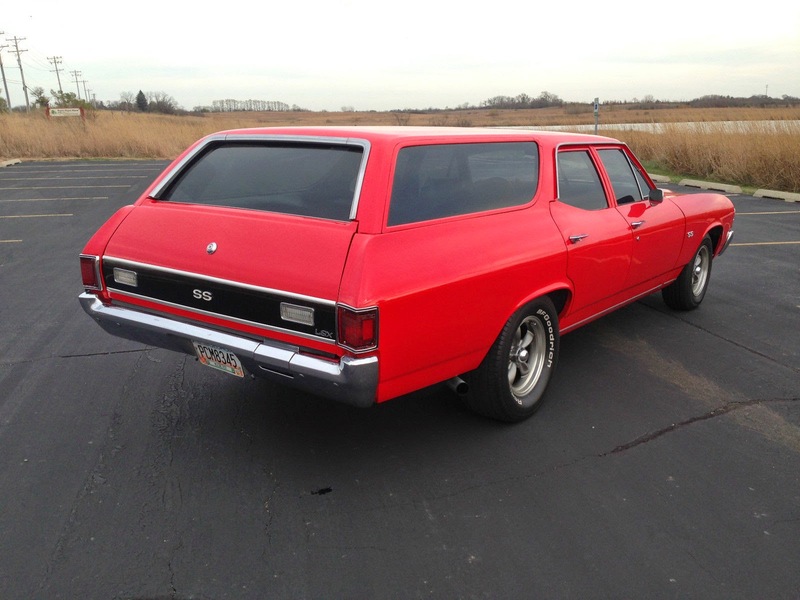 Today's featured Chevelle didn't start off as something that could keep pace with a Corvette, but a healthy injection of the good stuff has turned this car into an SS clone wagon. 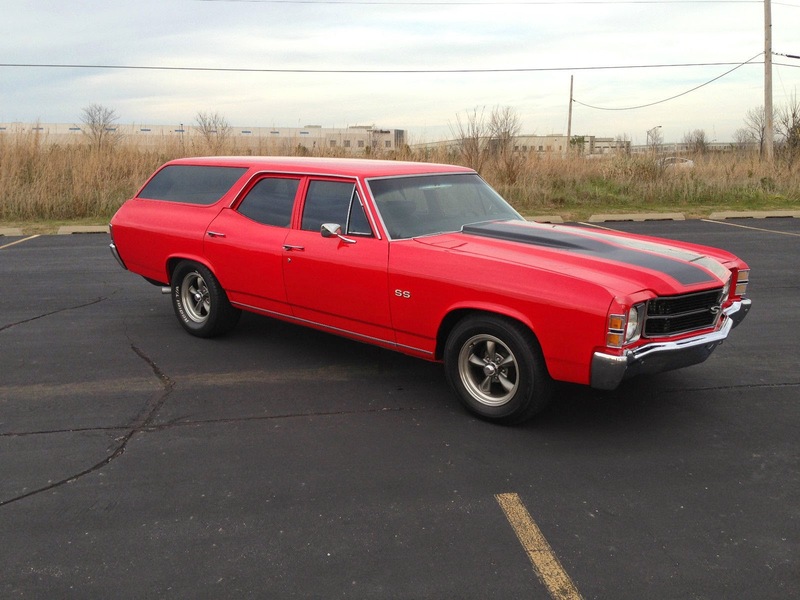 Find this 1971 Chevrolet Chevelle Wagon offered for $18,500 buy-it-now or best offer on eBay, located in Barlett, IL with a few hours to go. 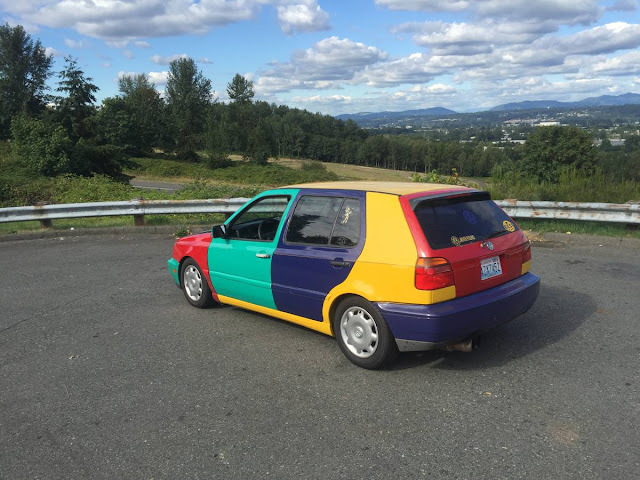 The seller seems like a straight shooter and says that the paint/body in my professional opinion is a 20 footer. Meaning the car looking amazing from 20 feet away, the closer you get you'll notice the imperfections. The paint doesn't look like a 20 footer in the photos, but it is best to heed the seller's opinion and be pleasantly surprised when this thing arrives via flatbed. 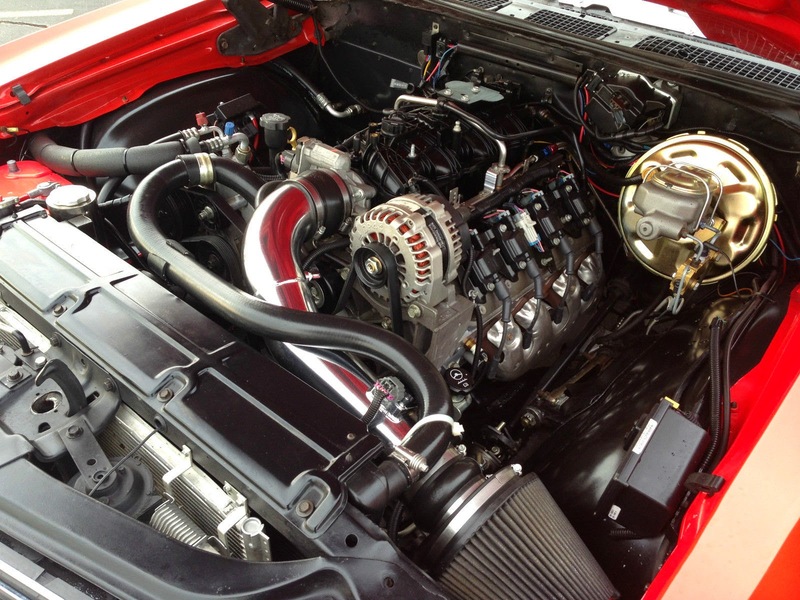 Under the hood is a very nicely presented LS-series 5.3 liter Chevy Gen III small block V8, probably an LM7 which would have been rated at 270-295 horsepower depending on year. The aluminum heads/iron block combo makes a great starting point for a boosted application, but if you want Corvette levels of power without forced induction you'll need to swap the intake/heads and do some tuning. The iron block of the LM7 adds a few pounds of mass over the LS1 etc aluminum block versions, but you won't notice the difference in beast like this. The biggest problem with this SS clone wagon is that for almost $19k you can get into all kinds of 2-door Chevelles that do have paint that looks great up close. Let's take a look at an example of what you can get with the same amount of cash. Like this 1966 Chevrolet Chevelle that is offered for $18,900 buy-it-now or make offer on eBay in Macomb, MI from this very pretty lady with a belly button piercing. 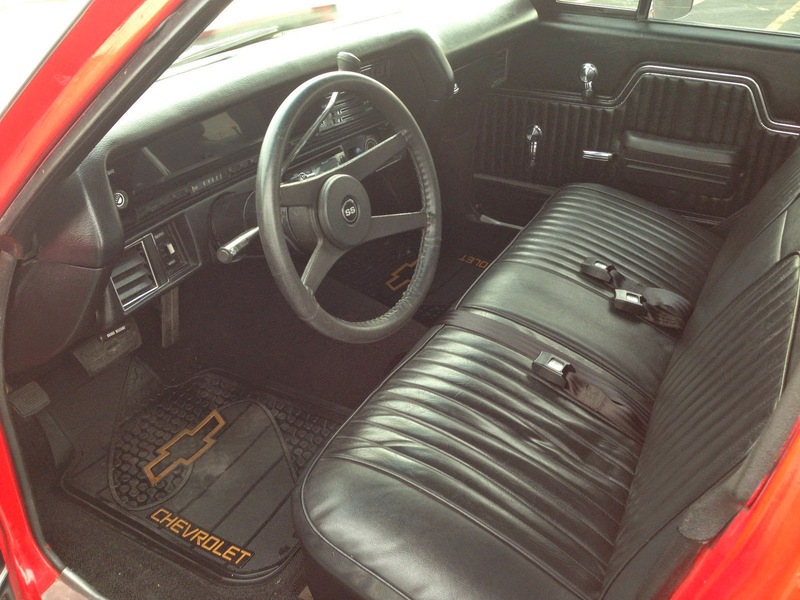 This is a 4-speed equipped Chevelle which I hear is very popular with the heel-and-exposed-toe crowd. Should you feel the need to kick the back end out, lap belts will keep you from sliding around in your seat mid-drift, while coincidentally wrapping around your exposed mid drift. It might not have a fuel injected LS based V8 inside, but the it does have a 350 cubic inch V8. You might want to inspect the tops of those fenders for any belly button stud scratches that this young lady may have accidentally caused while she was adjusting the distributor timing, cleaning the carb or adding brake fluid. This car will instantly bring a smile to any face, just look at those pearly whites!! D.T. 's comment about the photos being nicer to the exterior may be due to the fact that the seller stated the paint was a twenty footer, then took all his pictures from twenty feet or more away. The interior pictures were out of necessity taken from closer than twenty feet. Forgot to mention, I think I had rather have the wagon, but would find some other way to secure the air intake than a tie wrap to the upper radiator hose! When I saw the pictures I was thinking about wrapping an entirely different hose. Sloth just won the internets. That second deal would be a whole lot of fun but probably a whole lot of trouble with the Michigan authorities. That one is built for speed. What's the legal age in Michigan? Huh? Oh! For DRIVING, you perverts! What's the legal age for driving in Michigan?! It's so easy to be misunderstood on the internet.